I’ve got a great guest post today from one of my sponsors. The lovely Sarah is a librarian at a K-8 school so she really knows her stuff when it comes to Children’s books and young adult lit. I know a lot of you ladies have kids so hopefully you can find some great new reads for them! And even if you aren’t a mama, you may want to give some of these a try :). Here’s Sarah!! I’ve found, that for most people, when you ask them what their favorite book was as a kid, they can A- answer you immediately and B- give you a vivid memory about something they loved about it. My theory is that this is not a coincidence. Yes, memories from childhood are often vivid. The years between 0 and 10 are probably the longest years of our lives, but I firmly believe that the reason we love books from our childhood is because those books were really really good! How else could I continue to read them as an adult and enjoy them? And I’m talking, staying up late with a flashlight under the covers devouring a book kind of enjoy. Okay, maybe I don’t need the flashlight anymore but the devouring part is still there. And because I couldn’t think of any old classics to compare these too but can’t keep them to myself. 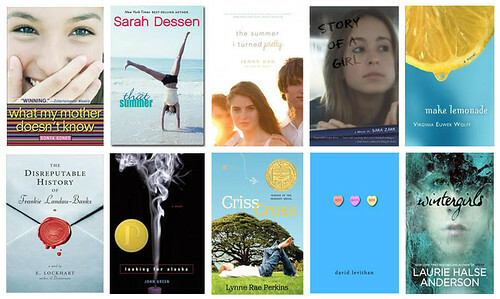 Here are a list of amazing young adult novels. All are available on indiebound.org or go to your local library (the children’s room will bring back great memories, I’m telling you) and check them out! Thanks for having me Malori, for more musings on kids books, YA, writing and my general life, come say hi at my blog, Desirous of Everything! Sarah, I love this list, and this post! Your passion comes through loud and clear! Love your comparisons, Sarah! I've read many of them, especially the uhmm…older ones, and added a couple to my to-read list. Malori…fantastic blog!